I can't think of a more fitting way to wrap up this Calvin and Hobbes retrospective than with the final strip ever published. This appeared in newspapers on December 31, 1995, and while it has that "new year" vibe, as the finale, it's a great "looking ahead" ending. It's certainly not the funniest strip in the series, but Calvin and Hobbes doesn't always need to be funny to be on top of its game. This one captures the essence of childhood really well, and I think the spirit of the strip as a whole, too. 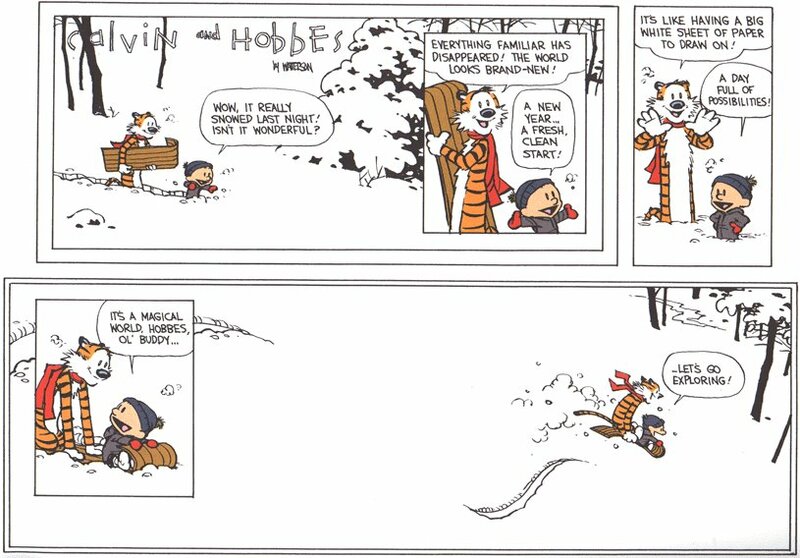 And again, I always marvel at how much snow Calvin's neighborhood gets. Just absolutely perfect for exploring. Let's keep life magical.